Ben Macintyre’s The Spy and the Traitor; The Greatest Espionage Story of the Cold War is the true story of Oleg Gordievsky, a KGB colonel who spied for the British and later defected to the United Kingdom in 1985. “Oleg Gordievsky was born into the KGB: Shaped by it, loved by it, twisted, damaged, and very nearly destroyed by it. The Soviet spy service was in his heart and in his blood. His father worked for the intelligence service all his life, and wore his KGB uniform every day, including weekends. The Gordievskys lived amid the spy fraternity in a designated apartment block, ate special food reserved for officers, and spent their free time socializing with other spy families. 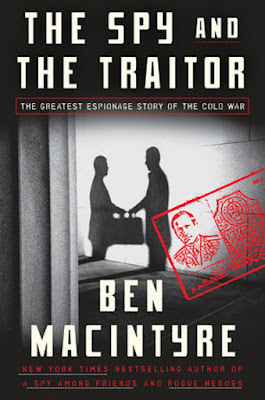 Gordievsky was a child of the KGB,” Ben Macintyre writes in the beginning of the book. He went on to state that the KGB – the Komitet Gosudarstvennoy Bezopasnnosti, or Committee for State Security – was the most complex and far-reaching intelligence agency ever created. The KGB had the role of both foreign and domestic intelligence gathering, as well as internal security enforcement and state police. The KGB controlled every aspect of life in the Soviet Union. Gordievsky moved up the chain in the KGB to become the rezident, the senior KGB intelligence officer in London, working out of the Soviet embassy. For more than 10 years he was also working as a double agent for the British. As Ben Macintyre points out in his outstanding book, Gordievsky became disillusioned with Soviet Communism while posted in Copenhagen. The Soviet police state paled in comparison to the freedom of the West. His disillusionment became total after the Soviets invaded Czechoslovakia in 1968 and he decided to spy for the British. His intelligence was so valuable that British Prime Minister Margaret Thatcher and President Ronald Reagan were given briefings on Gordievsky’s insights into the KGB and Soviet political leadership. The CIA was not told who the Brit spy was, so they launched an investigation to learn who the valuable British asset was. Unbeknown to the CIA at the time, one of their own, CIA counterintelligence officer Aldrich Ames, was a spy for the KGB. After being tipped by Ames, the KGB became suspicious of Gordievsky. He was interrogated, drugged and kept under surveillance in Moscow, but he had not yet been arrested and charged with espionage. The British had earlier developed a plan to exfiltrate Gordievsky from Russia when he felt the day had come. Now he sent a message to the British to rescue him and the daring operation to pull him out of the Soviet Union began. While working in Copenhagen, Gordievsky had supplied intelligence on the KGB’s Scandinavian operations. In London he had provided information that affected strategic thinking in 10 Downing Street and the White House. Much of his information had not been fully used, as it would have been incriminating. Now safely in British hands with the operational case ended, Gordievsky’s 11-years of intelligence was exploited to the full. Although Ben Macintyre compares Gordievsky to Ames, the former KGB officer and defector is perhaps the other side of the coin to Kim Philby, the British spy and traitor who defected to the Soviets in 1963. Gordievsky was in a sense the UK’s return shot to the KGB after their success with Philby. (Ben Macintyre also wrote a book about Philby called A Spy Among Friends). Like A Spy Among Friends and Ben Macintyre’s other books on the world of intelligence, such as Agent Zigzag and Operation Mincemeat, The Spy and the Traitor offers suspense and action and reads like a thriller. The book is well-researched, well-written and is a must for students of espionage.